In 1972, I was teaching at Punahou School Honolulu Hawaii. It was during this period of my life that my housemate, Bill, approached me one rainy Sunday morning with a proposition. “We are going to become farmers…we’ll have a 100 acre papaya plantation on the Big Island (Hawaii, the largest island in the Hawaiian chain.) We talked about his business plan and let our 28 year old imaginations run wild. We rushed down to the local Foodland Market, bought 2 papayas, went to the garden shop and bought a shovel and Dixie cups, came back to the house and planted about 300 seeds in the backyard! Within a matter of 2 hours we started our first farm. I didn’t end up farming papayas. I grew delicious lettuces and vegetables in the Manoa Valley and sold my crop at the local Farmers’ Market. Still bitten by the farming bug, eventually, I decided I wanted to be home, the bay area to be near my family. Now, 43 years later, Bill and I are both still farming, he in Thailand and I, here in Brentwood. The first day I came to Brentwood was in January, 1976, after inquiring about available farmland. I met Eddie Pippo, a Brentwood farmer/real estate agent, for coffee at Pat’s Truck Stop. After sizing me up for about 5 minutes, he said he knew the perfect parcel of land for me. We left the Café; coffees barely touched, and drove out to the cemetery, where he showed me 13 acres of bare ground. That was my first parcel, and we’ve been adding to it ever since. Today, we are up to 203 acres. For the first couple of years, I grew corn, and hauled produce for other farmers in the area as I waited for my first peach trees to grow. 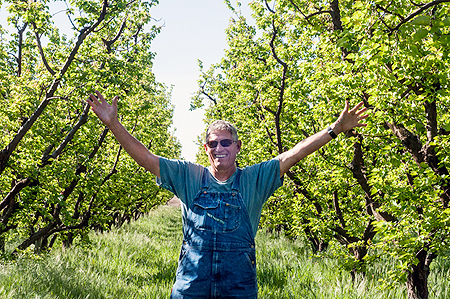 After they came in to production, I added more acreage and started our U-pick operation. Eventually, word spread about the quality of our fruit and we attracted wholesale buyers. By 1988, stopped our u pick operation, started making deliveries to local stores and attending the budding farmers’ markets in the bay area. We also added 20 more acres but, most importantly we went organic. As a new farmer that didn’t come from a farm family I relied solely on the advice of the Ag extension program, which at the time recommended the use of chemicals; pesticides, herbicides and chemical fertilizers. This never sat well with me and after going to conferences and meeting farmers in the burgeoning organic movement; I was inspired to farm organically. It was a new beginning for us: new way of farming, new markets, new name and new label. Our label is inspired by the “Wind in the Willows”, an allegorical tale of life on a river. The irrigation canal that runs along our land had so many frogs in it, at night the sound of all that croaking was deafening. And so the name “Frog Hollow Farm” was born. Everything has expanded; the land, the people, the products, markets, the delicious food and our community. The list is long but a few of the highlights over the years have been, creating a mail order business, building a kitchen on the farm to create value-added products with our unsaleable fruit, opening our shop in the Ferry Building, buying more acreage, and beginning our CSA. Lastly, is our amazing compost program. We produce 3,000 tons of compost a year out of our own fruit waste, tree prunings, our neighbors manure , decomissioned boxes and coffee grounds from the Ferry Building. Everything gets used here, a stark contrast to our wasteful food system which throws away 40% of the food that is grown to landfills where it produced methane gas, contributing to global warming. For me it’s been an amazing adventure, and I can tell you that not a day has gone by without its own element of surprise excitement, opportunity, joy and beauty! I feel like it’s all just the beginning. We’re on the threshold of the next great thing, and the best is still to come! In 1994 I was living in Berkeley and working in a restaurant called Oliveto as pastry chef. I had come there in 1991 after working 2 years at Café Fanny in Berkeley. There, I learned the importance of using the best ingredients and in season. It was where I first learned about organic agriculture and sustainability. This opened up a whole new world to me. During this period I learned to love so many foods, pears that I had always dismissed, because like most people I had never really had a good one (a Pettigrew Farm French butter pear to be exact), elephant heart plums, arugula, the list goes on. This experience shaped how I felt about what I wanted to eat; and made me want to connect with the people and the places that were growing what was best and it was ultimately the Fantasia that brought me to my husband. In 1995, I moved to Frog Hollow Farm and first did farmers’ markets and deliveries and learned the ropes, all the while making jams, and experimenting. In the Fall of 1998, we began selling pear tartlets at the farmers’ markets. We made or first batches of peach conserve first at Café Fanny Kitchen, then the Lark Creek Café Kitchen in Walnut Creek. Encouraged by an order of peach conserve by Oakville Grocery in Walnut Creek, and Metro Markets in Seattle, we decided to build a kitchen here on the farm, and in June of 2000, just in time for apricots we started.